Helping Melbournians move for 30 years! MID WEEK MOVING SPECIALS : On Now! – Monday to Friday – Full Door to Door Moving Service. Why Use Transcorp Removals & Storage? NO Depot, NO Call Out, NO Toll Fees or NO added Credit Card Fees! We service daily: Apartments, high rise buildings, narrow streets and small & large residences with a white glove silver service. AFRA & SSA Accredited, and most of our work is via referrals from existing clients. We are an authorised insurance provider and can insure your belongings whilst in our care. Melbourne Removalists You Can Trust with Stress free moves! AFRA & Toll (Army & Navy) only endorse furniture removalists that have the necessary equipment, vehicles, premises and staff training needed to complete a professional furniture move. Our removalists are proud to be part of the AFRA and Toll Moves family, ensuring that your office or house relocation is always performed to the high standards you should expect. We also provide reasonable rates – obtain a Melbourne removalists quote today using our online removalist calculator. Is it strongly recommended that you do not use any furniture removalists that is not AFRA (Australian Furniture Removal Association) accredited. AFRA provides support to clients that may be required when disputes on moving home arises. Without proper support, you risk having to take legal action against rogue Melbourne removalists should it go pear shape, costing you much more. It is simply not worth the risk when moving house if/when you allow all your precious items to be handled by unprofessional moving companies. We sell packing boxes and / or packing materials for your move at unbelievable prices (shop online) with delivery to your door. Order as little or as much as you like. If our Melbourne movers are also performing your furniture removal, we can also credit your unused new packing materials in full after we complete the relocation and return them to our depot for free. Watch AFRA’s short packing boxes video for tips on packing techniques. Local hourly removal rates have a general rule that the pickup and / or delivery point is no greater than 30kms from the Melbourne CBD area by road travel. For internal reasons, our Melbourne removalists consider anything beyond 30kms as country moves. For this, we have a fixed price for travelling whilst only charging for the collective time to load and unload our furniture removal truck. This way, you are only charged for the time that our furniture movers work plus the fixed charge travel. It’s a very competitive and popular way to perform your move, as you are not charged for any travel stoppages including food, lunch or refuelling. Please contact us to arrange a fixed travel rate, as it depends on the distance you are outside of the Melbourne CBD. You can also get a Melbourne removalists quote using our removalist calculator. We service Victorian towns including Moe, Albury, Horsham, Eden, Sale, Bendigo, Mildura, Shepparton, Orbost, Morwell, Warrnambool, Ararat, Castlemaine, Ballarat, Swan Hill and all other suburbs on-route (7 days per week). Expand the boxes below to view all the suburbs we service daily as well. Albert Park, Docklands, East Melbourne, Melbourne CBD, Port Melbourne, South Melbourne, St Kilda, Richmond, Essendon, Brunswick, Caulfield, South Yarra, Bentleigh, Chelsea, Clayton, Sunshine, Oakleigh, Werribee, Geelong, Hoppers Crossing, Point Cook, Ashburton, Balwyn, Canterbury, Hawthorn, Kew, Toorak, Glen Iris, Box Hill, Burwood, Brighton, Sandringham, Beaumaris, Black Rock, Hampton, Dandenong and Frankston. VOTED Top Removals in Melbourne by You, Our Customers – Thank You! How Do the Hourly Rates Work? Do You Have Short or Long Term Storage Available? Need Removal & Storage Insurance Cover? At Transcorp Removals, we offer all inclusive door to door moving rates for our removalists in Melbourne. Unlike our competitors, we charge the same hourly rate regardless of the furniture removal truck size required. Our clients find this the easiest and fairest method when moving house. You will also have the security of a nationally recognised award-winning removal company with over 30 years of moving experience. Our Melbourne removal teams are quick and very efficient when it comes to reducing your moving time! Our competitive Melbourne local hourly rates are based on door to door and only charged to the nearest 15 minutes when the job is completed (after minimum charge), meaning that you do not have to pay for depot, call out, lunch breaks, road tolls, return or even credit card fees. Be careful of added cost from our competitors. When you add all the potential extra moving charges noted above to a ‘seemingly’ cheaper hourly rate from our competitors (and their slow speed of moving and volume of breaks), you may quickly notice that you are paying more with our competition than moving home with us. More importantly, all our furniture removal trucks and containers come fully equipped with accredited staff, tools, trolleys and blankets to move you safely and efficiently. No job is too small or too big for one of the most trusted removal companies in Melbourne! Call us today or use our online removalist calculator to obtain a quote. 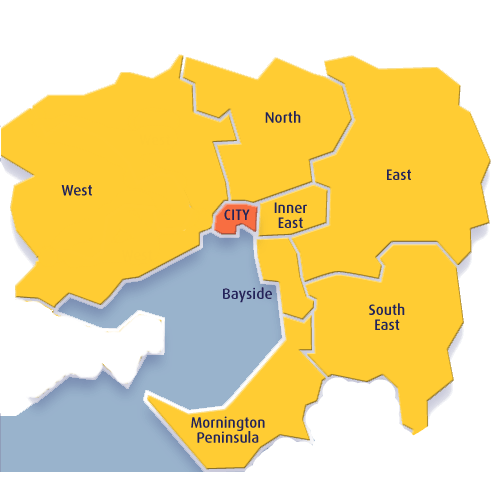 Generally, when moving home within the Melbourne CBD area, you’ll find that the hourly rate will best suit your needs. This is mainly due to being charged for the time that the local Melbourne removal team take to perform your removal job. With Transcorp’s door to door rates, you’ll be charged to the nearest 15 minutes (after the minimum charge of 2 men for 2 hrs). This option means you pay for your moving time only. With Transcorp local removals, you are quite literally paying for the removal time spent in performing your move without adding additional costs at the end of your Melbourne removal, such as depot, return or call out fees. Provided that you have supplied the correct address and access details together with an accurate inventory of what needs to be relocated then at the time of quoting or booking with us, you may request an ‘expected’ charge based on the hourly rate. This will give you a fair indication of your moving budget. You can also view our “Estimate Tool” to get a Melbourne removalists quote online. If you prefer a ‘fixed moving price’ so that you clearly understand your moving costs with no added moving charges, it’s possible to either request an on-site inspection in Melbourne by a qualified Transcorp moving representative or you can request the same over the phone. Just keep in mind that a fixed moving price may be slightly higher to cover for worst case scenarios such as parking issues. A fixed price is generally the preferred method when a third party is paying for the move, i.e. a corporate or insurance move that requires a fixed price for internal purposes. It is also popular for clients who prefer to know their Melbourne move is fixed with no additional removal charges. An hourly rate will in most cases be a slightly cheaper moving method, but we also understand and offer the fixed price moving method on a regular basis too. Please call our sales representative to discuss your individual circumstance and we can better advise you of the recommended moving solution if you decide to move with us. Yes, Transcorp Removals & Storage is accredited with several organisations, including the Australian Furniture Removal Association (AFRA), Self Storage Association (SSA), and International Association Movers (IAM). AFRA only endorse furniture removalists that have the necessary equipment, vehicles, premises and staff training needed to complete a professional furniture move. Our removalists are proud to be part of the AFRA ensuring your house relocation is performed to the high standards you expect. Is it strongly recommended you do not use any furniture removalists that is not AFRA (Australian Furniture Removal Association) accredited. AFRA provides support to clients that may be required when disputes on moving home arises. Without proper support, you risk having to take legal action against rogue Melbourne removalists should it go pear shape, costing you much more. It is simply not worth the risk when moving house if/when you allow all your precious items to be handled by unprofessional moving companies. Yes, if you’re moving and don’t have time to pack, we offer packing and unpacking services to help minimise stress. Our experienced packing staff can pack and/or unpack your boxes and precious items before we move you thanks to our specialised valet packing and unpacking box service. Whether it’s only a few boxes or the whole house, we’re here to help you – and it’s cheaper than you think! Let Transcorp’s highly qualified staff take care of the hassle of preparing your house before and after your moving truck comes along and help you better and quickly settle in and relax. Our professionalism and experience is second to none and we are proud AFRA (Australian Furniture Removals Association) and SSA (Self Storage Association) accredited members, plus we have over 30 year of experience! We can provide a 4 hr minimum valet packing or unpacking service for 2 staff before or after the move day, which typically accommodates for 35 to 40 boxes to be packed or unpacked. If required, we can also pack your breakable items on the actual day of the move (if only 5 to 20 boxes) at your gazetted hourly moving rate. This would be performed by the Melbourne removalists on the day of the move itself. Both options are very popular when moving home in Melbourne. Ask your representative for more information if required. Yes, we can provide short or long term storage for home and office moves. When you choose us for furniture storage, you can rest assured you’ll receive a solution that’s backed by the security and support of a qualified AFRA (Australian Furniture Removal Association) and SSA (Self Storage Association) accredited member. We can fulfil all your moving and storage needs. We offer very competitive and cost-effective local furniture storage options via 20ft furniture shipping container(s) or secure home module(s) solutions. All our secure storage solutions provide you with the peace of mind that we have the ability to successfully manage all your storage requirements – from pickup to final delivery – without you needing a self-storage facility, potentially minimising double handling. Our storage facilities include trained and qualified staff, security cameras, 24hr monitoring, pest and dust control, and security gates to give you complete peace of mind. You can store from 1 day (overnight), a few weeks or months, or even a few years! We sell packing boxes and / or packing materials for your move at unbelievable prices with delivery to your door. Order as little or as much as you like. If our Melbourne movers are also performing your furniture removal, we can also credit your unused new packing materials in full after we complete the relocation and return them to our depot for free. Our Insurance accredited sales staff can offer comprehensive removal/storage insurance in the case of unforeseen accidents (fire, theft, transit damage, etc.) for damages that are out of our control and deemed ‘accidental’. We are able provide a certificate of insurance with you the nominated policy holder in case of a claim when moving and/or storing your contents whilst in our possession. Important: If a removal company offers insurance on damages as part of their hourly rate or fixed price but can’t offer you a policy in your name, then they are not insuring your goods but rather offering ‘assurance’, which is only a promise they may make good on if goods are damaged during their move. Typically, their long terms and conditions (ask to see them) will aim to void claims with numerous conditions attached. They can make the process of dealing with damaged goods very long and arduous in the hope you do not follow through with your claim against them. Consider insurance carefully, as moving home is not a regular occurrence. Transcorp’s qualified estimators (internal and external) can directly quote and arrange your insurance without the need to go through a broker or insurance agent. Check out our great insurance rates. We also now offer ‘blanket cover’ as an option! Regardless of how careful we are with our removals Melbourne wide, we want you to have peace of mind your belongings are properly covered – and insurance provides peace of mind.